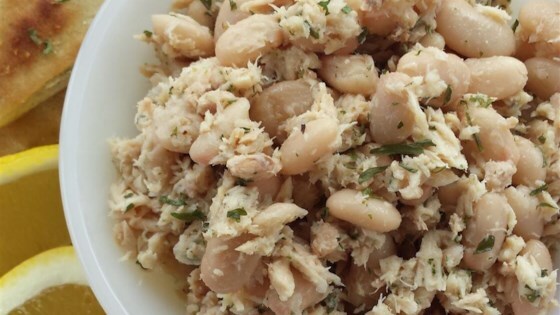 "The combination of tuna with olive oil, lemon juice, and beans is inspired by the cuisine of Italy. The beans are green beans and cannellini beans, also known as white kidney beans. Serve cold or at room temperature." In a large bowl, mix together green beans, tuna, cannellini beans, chopped onion, olive oil, lemon juice, garlic, and cheese. Season to taste with salt and black pepper. Cover, and chill in the refrigerator for about 2 hours. Very Good! So easy, and it tasted great. I served it on top of spinach leaves, but next time I will stuff it into a pita for a main dish sandwich. Great, easy recipe- throw it all in and mix- all done! Lots of flavor- use on top of spinach leaves or filler in pita. delicious! great blend of flavors-- the onion looks like it will be overwhelming, but it fits perfectly into the dish.